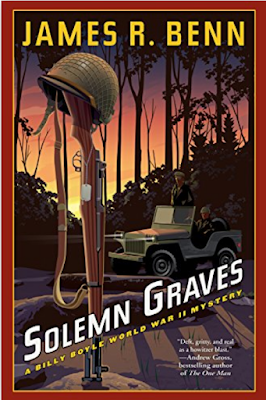 Spies, enemies, and friends with mixed motives: good thing investigator Billy Boyle has his close friends Kaz and Big Mike with him in Normandy, France, in July 1944, because that may be the only loyalty he’s sure of. This 13th in James R. Benn’s must-read series of police work during the Second World War is a page-turner with complicated twists and the constant background of shellfire—often threatening Billy Boyle’s safety as he investigates close to the line of Germans trying to regain ground. Boyle is a straightforward young American, the newest generation in a family of Boston cops. His relatives thought they’d carve a “safe” wartime slot for him by maneuvering him into the service of General “Ike” Eisenhower, a distant cousin by marriage. But Eisenhower’s early transition to the front of the war has carved out a dangerous and fascinating career for Billy, as an almost-civilian police officer probing the situations that threaten the general among his own forces. 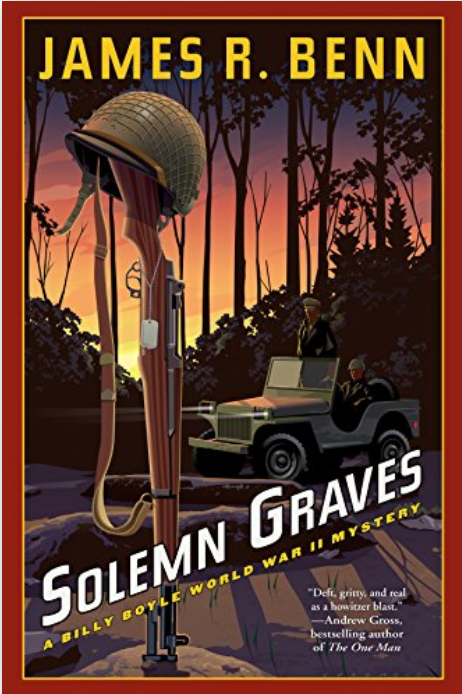 In Solemn Graves, Billy Boyle and his team must investigate the murder of an American officer in a manor house close to the front lines in Normandy. Even the presence of Major Jerome in the house is supposed to be top secret, due to the unit he was supposed to advise: the 23rd Headquarters Special Troops, also called the Ghost Army. Like the group featured by British author Elly Griffiths in her “Mad Men” series, these troops are creating phantom action to distract, disorient, and misinform the Germans nearby. ‘Now, Captain Boyle, you shall see how we punish the collaboration horizontale,’ Legrand said, laughing as his men forced the four women to sit on the steps. But not to receive a bullet. Theirs was to be a less lethal, but still cruel, punishment. Men with scissors and hair clippers grabbed them roughly, pulling up their hair. They held them that way for a long minute as the townspeople heaped abuse on them. At a sharp command from Legrand, they began hacking away. ‘This is mercy?’ I asked, watching the girls. One wept, while another held her head high, maintaining what dignity she could. Another was noticeably with child . . . But it was the faces of the townspeople . . . that stunned me. They were gleeful. They jeered at the girls, taunted them, reaching forward with wagging fingers of righteous disapproval. Deep groans of satisfaction arose as the old clippers drew blood. Wild, shrill laughter rang out from hearts and throats unrestrained by pity. Meanwhile, at the manor house, Billy at first thinks he’s seeing true compassion, while the owner shelters a traumatized young woman, speechless and frail, and so lovely that every soldier billeted there seems to fall in love and want to take care of her. Eventually he has to wonder, though, how she came to be spattered with the blood of the murdered major. And why. And whether the crimes in play could injure the American battle underway. As usual, Benn’s written a great page-turner, loaded with likeable characters and situations of compelling moral anguish. There is more to Billy Boyle’s war than the positions of the soldiers: It’s people’s hearts and loyalties that matter most.